Who is ready for fall??? I am certainly not wishing summer away by any means (in fact, we have a beach week coming up, so summer isn’t over for us yet! 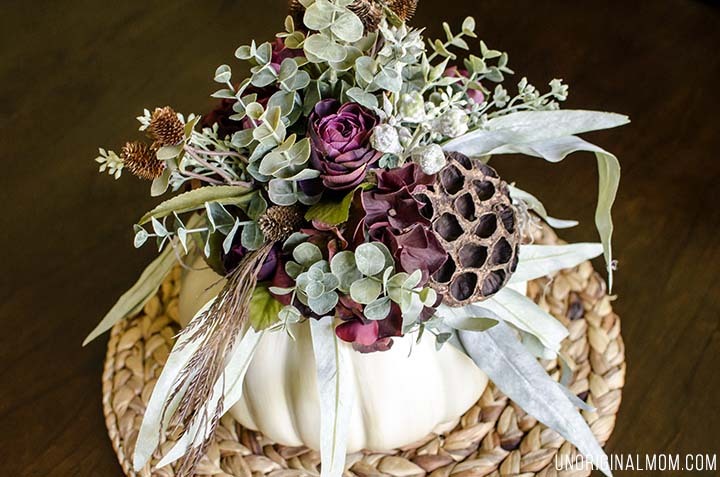 ), but I’ll admit I’ve been dreaming of fall decor ideas for weeks now. The season change from summer to fall is my absolute favorite, and I love the colors and textures of autumn. Now, while I really love the traditional autumn colors of red, orange, and yellow OUTSIDE (I live in central PA and we get stunningly beautiful leaf color each October), I tend to prefer a more subdued and neutral color pallet when I decorate for fall inside my home. That also allows me to start sneaking in fall decor early (in say, mid August ;-) ) without so much of a shock to the system. 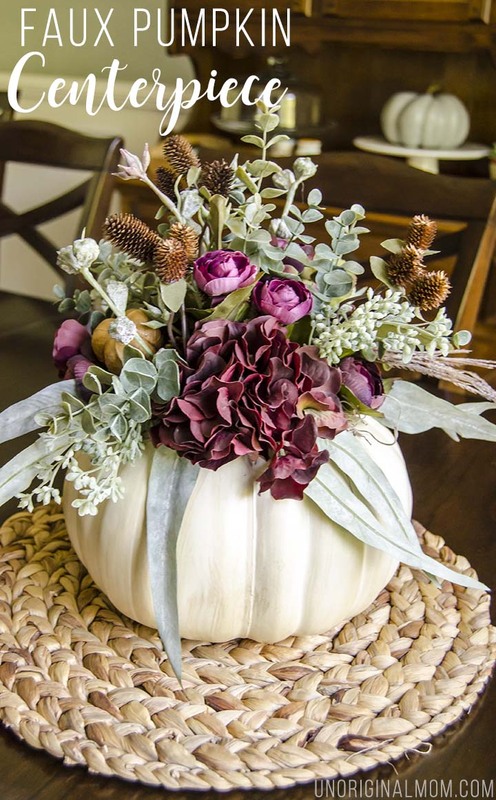 So I decided to create a centerpiece with some more neutral and even non-traditional autumn colors that I could sneak onto my dining room table now – and last all the way until Thanksgiving! 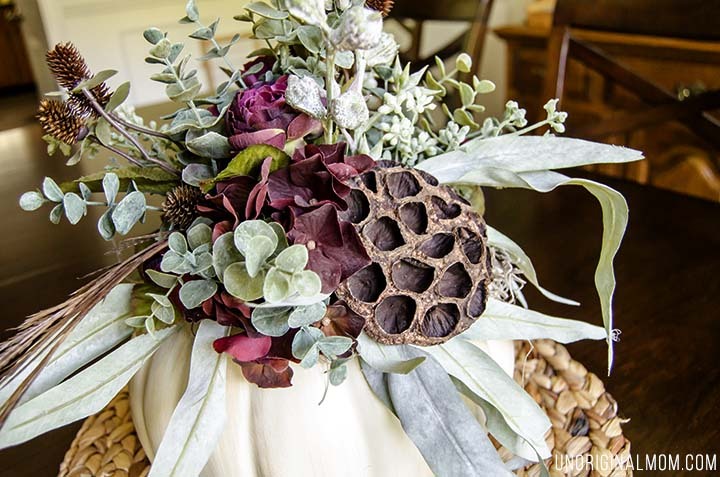 Here’s what I used to create my faux pumpkin floral centerpiece – I got everything at Michael’s. 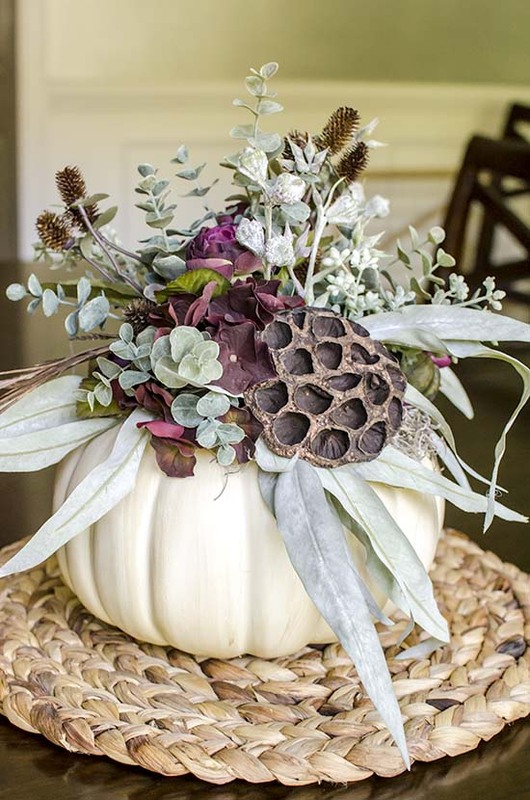 A white craft pumpkin, some floral foam, and plenty of faux floral stems. 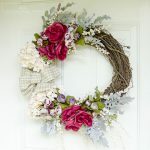 You’ll also need wire cutters, hot glue, and some spanish moss or something else to cover the top of the floral foam. 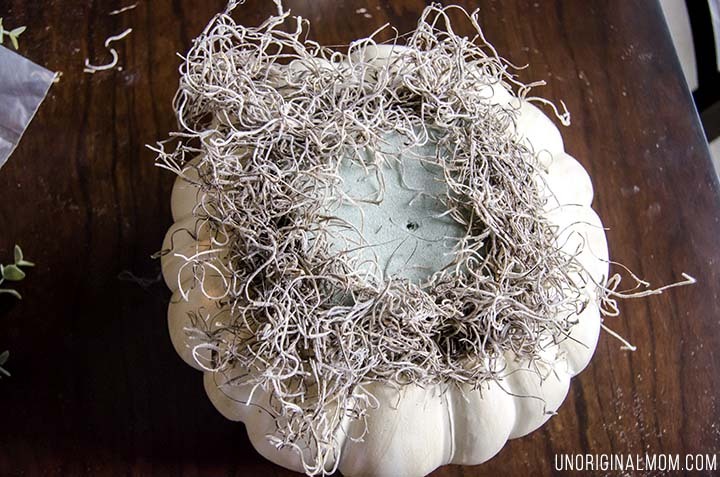 I used a box cutter to cut off the top of the pumpkin. 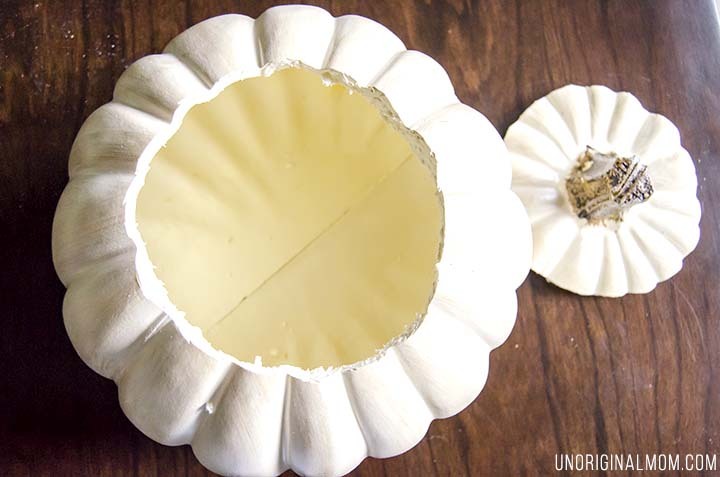 Then I cut down some floral foam to fit inside the pumpkin and hot glued it inside. It stuck up out of the pumpkin by about a quarter of inch. Then I hot glued some Spanish moss around the edge of the foam to make sure it wouldn’t be visible once I was finished. Then I just started adding flowers! I used the wire cutters to cut apart the bunches of flowers so I was working with individual stems and then started sticking them into the foam. I don’t have any great photos or tips…just keep experimenting until you get it how you like it! I have NEVER done any flower arranging before…so I had absolutely no idea what I was doing, haha. 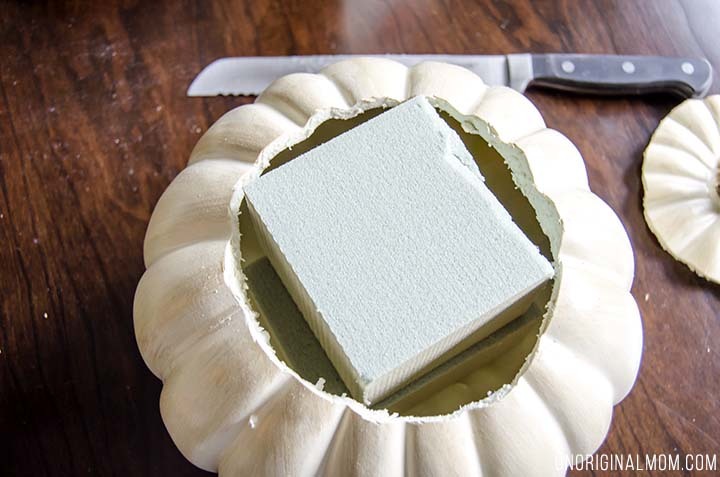 I did a lot of trial and error – luckily the foam is forgiving and it’s easy to pull things out and try them in a different spot. The colors and textures work so well together, don’t they? I love the combination of the sage green with deep purple. 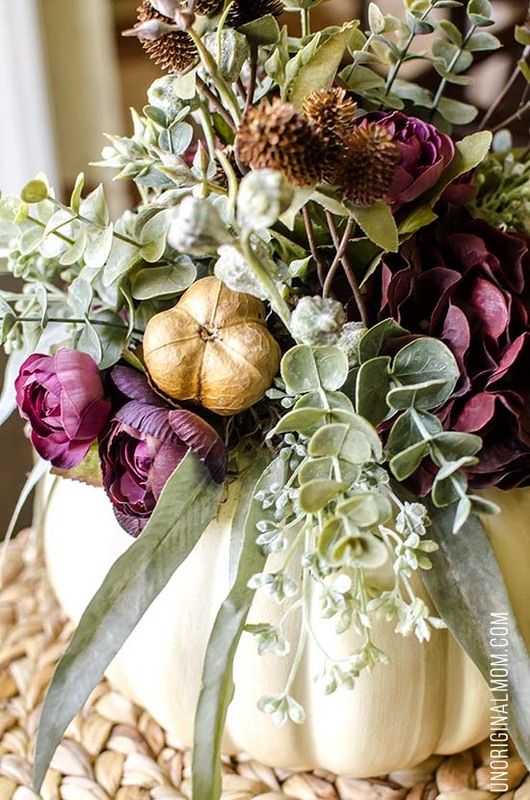 It’s a totally unexpected variation from the traditional fall colors but still so pretty! In fact, if it weren’t for the pumpkin, this could almost be an arrangement for any time of year. 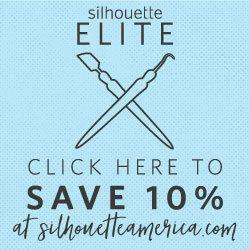 It’s a perfect subtle transition to fall, don’t you think? 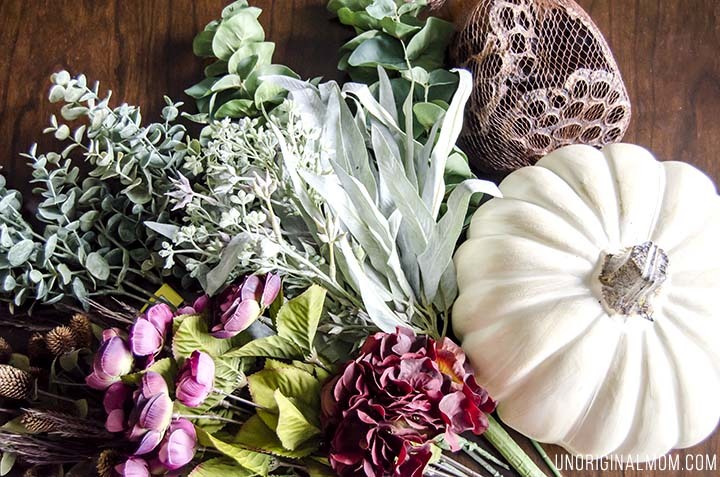 And I’ll be able to use it within a larger tablescape with more traditional fall decor elements as we get farther into the season. 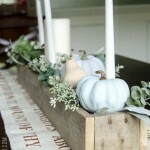 I can see this being a beautiful thanksgiving centerpiece, too! I’m so proud of my first attempt at floral arranging :-) It’s no professional piece, but I think it turned out pretty well! And let me tell you, folks, if I can do it, YOU can most definitely do it too! 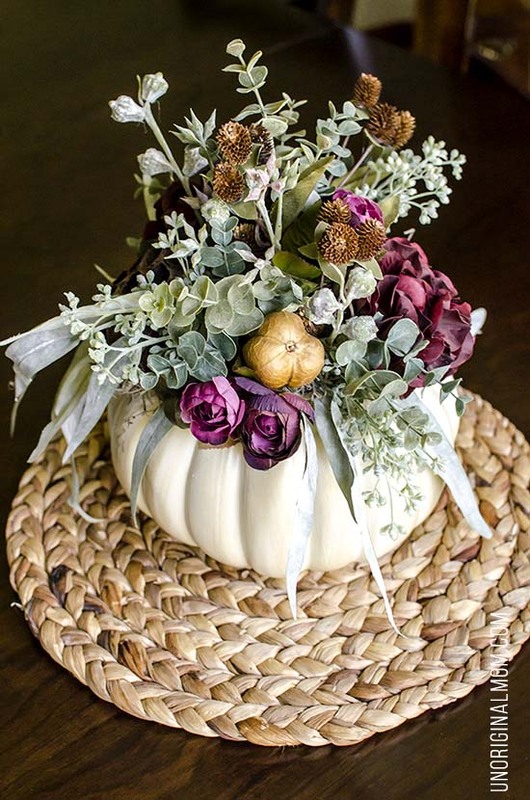 Have you started any fall decorating yet? What do you think…do you tend to like the traditional colors or more unexpected elements? 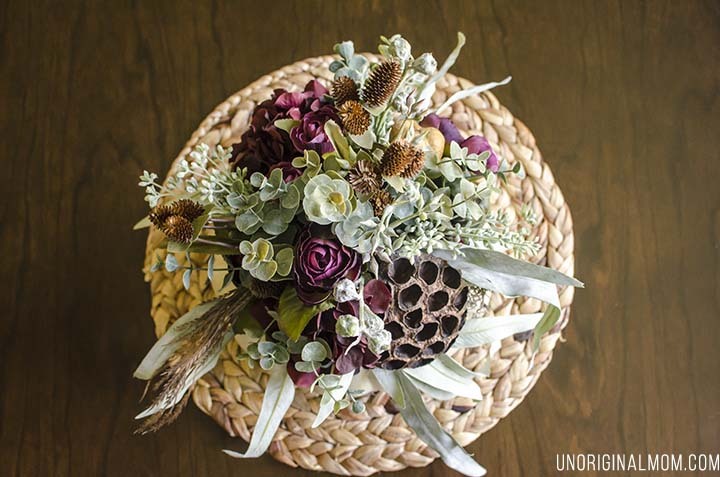 Your fall arrangement is beautiful! I love the colors you put together. 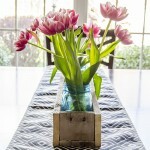 I would not have guessed it was your first time putting a floral arrangement together! I love those colours! It’s definitely fall, but with the purple and greens it’s not screaming fall! I too struggle with flower arranging. I’m always fighting with myself not to make it too symmetrical. Great job! How much did you pay for all of the items you used? I don’t remember exactly, but I know I used coupons for a lot of it :-) I’d guess around $20-25? But I had a bunch of florals leftover for use in other projects too.